Do you love to get specialty cakes at stores? Every so often we buy ourselves a treat and get a store bought cake – usually one that’s not something I can easily make at home. Lately, I have fallen in love with some of the specialty cakes with fun fillings inside, including extra icing. 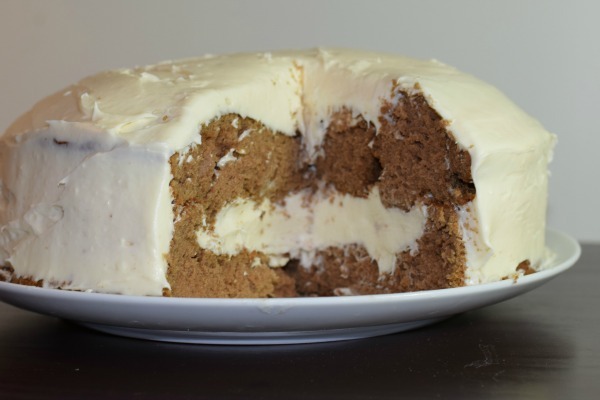 I have even seen cakes filled with extra cream cheese icing in the center and I had no clue how they even do it. Recently, however, I discovered the secret – a specialty cake pan! As I was researching pans I ran across the perfect pan to make it to where we rarely had to buy cakes out – the Mrs. Fields Fill N Flip Locking Layer Baking Pan. Mrs. Fields Fill N Flip Locking Layer Baking Pan: What Is It? Want to make a fun treat for someone in your family? 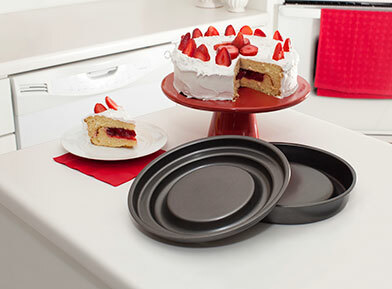 If so, we think you will love baking a cake with the Mrs. Fields Fill N Flip Locking Layer Baking Pan. 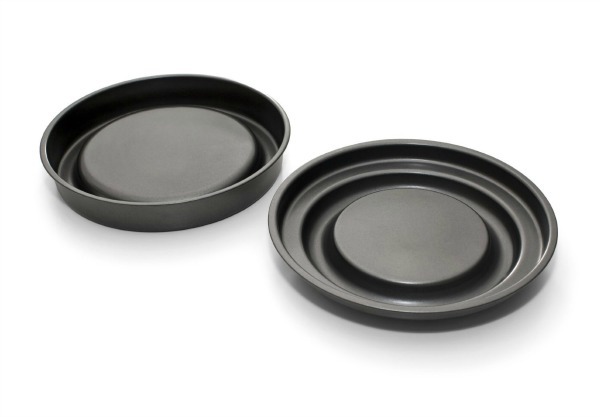 This round cake pan allows you to bake a cake and once cooled, flip the cake over and fill it with your favorite fillings, including pudding, fruit, or anything you choose. Once filled, just flip the non-filled cake on top and you have a fun layered cake that everyone in your family is sure to love! Best of all, with its non-stick coating, removing the cake and cleaning after baking is super easy! With this Mrs. Fields pan, baking has never been so fun! I will be the first to admit, I had a lot of fun baking with this pan. Not only was baking a filled cake super easy, but clean up was a snap with its non-stick coating. To test out the pan, I used a modified version of my favorite red velvet cake recipe (included below). Instead of making it as I have in the past or turning it into cupcakes, I filled with our favorite, homemade cream cheese icing. To my family, that has always been the best part of a red velvet cake and having that special surprise inside made it even more fun! Really, I couldn’t be happy with this pan and can’t wait to try other Mrs. Fields products! Based on my own experience, I am happy to give the Mrs. Fields Fill N Flip Locking Layer Baking Pan an A rating! Want to purchase this awesome pan for yourself? You can buy the Mrs. Fields Fill N Flip Locking Layer Baking Pan on Amazon.com for under $15. Who knew you could get such a cool pan so iniexpensively? Want to learn about more Mrs Fields Products? 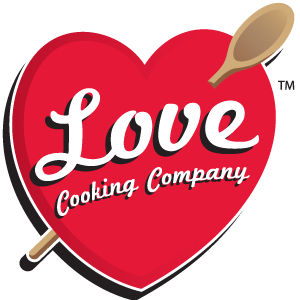 Check out other Love Cooking Co. on Social Media! This is such a great idea! My daughter makes a few cakes that she could modify for this cake pan, and it would be soo much easier to use. Yum, this looks delicious, the Mrs. Fields Fill N Flip Locking Layer Baking Pan is a great idea, definitely a worthy purchase. Thank you for sharing this review. Just looking at the red velvet cake made ne wabt to have some right now. The flip lock baking oabs are narvelous. I wiukd love to get one. Sugar overload! But what a way to go. I like the frosting best. Fun cake pans. What a good idea. My husband would think I went to a bakery if I served him a cake like that. The pan itself is very reasonably priced and I’d love to be able to serve something that looked and tasted good. What a great way to add your own touch to a special cake for a special event. Wow, I have never seen one of these before! Thank you for sharing! I have seen these and have always wondered of tthey acrually worked or were one of those things you buy and it turns into a mess and you never use again. It looks terrific and it sounds fairly easy. Thank you Ellen! If it helps, that was with my husband being impatient and trying to cut it with an improper knife! It seems to hold up very well with this pan! lol! I like how easy this is to use and the non-stick coating is a huge plus! As yummy as cake is, cake with a thick indulgent filling is always soooo much more delicious and special! What a creative and helpful pan this would be! This would be a great gift for a fellow baker too! I like it. It does look eirth trying out. I usually make a mess of it on my own. Thank you for the review. I love this idea. It’s hard to make a filled cake, so it’s cool to see that there is a pan that makes it so easy. I need this! I’m always baking, layer cakes especially, so this would really come in handy. I could fill my cakes with all KINDS of goodness with this pan. And the price? You would expect this to be way more expensive than what it is. I can’t wait to try! I know – I can’t believe they can make a quality pan that cheap! Anyone else remember when a non-stick cake pan was like $40 for both pieces? These baking pans are pretty neat. I would be able to make so many different kinds of deserts with these pans that I wouldn’t normally be able to easily make. Sounds like a nice cake baking pan. It gets very good reviews on amazon and the price is reasonable. This would make some fun cakes . Got it, love it, easy to use. My family now thinks I make fancy cakes.